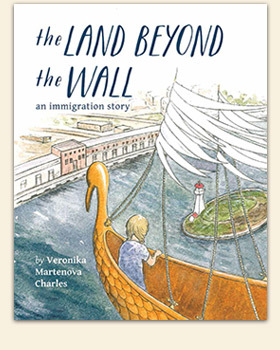 Veronika Martenova Charles is an award winning author whose books for children reflect her fascination with story, mythology & cultures from around the globe. Emma lives on the grey, cold, lonely side of a wall, where people speak in whispers and no flowers grow. On the other side, there is happiness and colour, but she can never go there. A beautiful allegory that uses magical realism to confront the hard realities of immigration and the universal struggle of finding one's voice and one's place in the world. a fun and highly accessible read for youngsters. Easy-To-Read Wonder Tales Books 6-10! Here are five more books for fledgling readers that offer the enjoyment of a good story along with the thrill of accomplishment that comes from independent reading. Each book presents three different versions of a well known fairy tale. "an excellent resource which shares a great way to teach fairy tales and inspire story building in children." "Charles proves that, despite the digital age and the barrage of multimedia, storytelling today is alive and healthy in classrooms as a form of literary expression." A groundbreaking new book that provides teachers in the early grades with the background and practical approaches to maximize the potential of traditional tales with their students. To accompany Easy-To-Read Wonder Tales books 1-5.